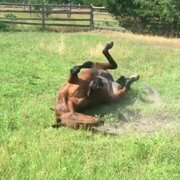 Over the weekend, a video of a collapsed calèche horse in Montreal, Canada, went viral, showing the world that the popular tourist attraction comes at a cost. In Montreal, the horse-drawn carriage, known as the calèche, is still alive and well. Like New York’s horse and carriage tours of Central Park, calèche is part of the city’s tourist industry, ferrying visitors to and from historic sights in Ville-Marie. 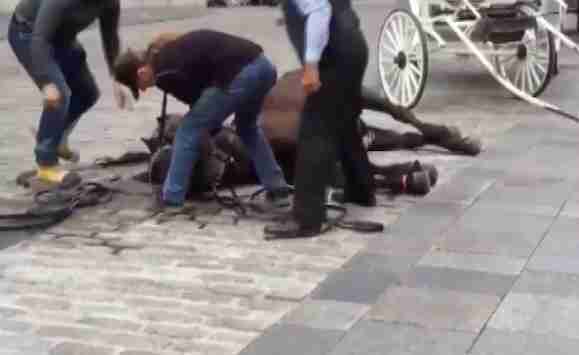 The short clip, posted to Facebook by Diane Villeneuve, shows a horse lying unresponsive on the pavement as crowds in Old Montreal, a popular tourist destination in the city, look on. Villeneuve was walking with a friend near the Notre-Dame Basilica on Monday when she saw the horse, attached to a carriage, fall to the ground. “I saw the two front legs of the horse bend and she hit the ground headfirst,” Villeneuve told The Dodo. “The owner jumped out to help his horse, but the horse was unresponsive. No movement at all.” Two other men arrived to aid the calèche driver with his efforts. They removed the harness from the horse, but when the horse still didn’t budge, Villeneuve watched as they tried to pull the horse by the bit in her mouth. When Villeneuve couldn’t stand it any longer, she called the police. “After five minutes of this pulling and yelling, I decided to call 911. This horse was in bad shape. Honestly, I thought she would never get up,” Villeneuve said. While waiting for law enforcement to arrive, Villeneuve took out her smartphone and started filming so she could have proof — and it was a good thing she did. 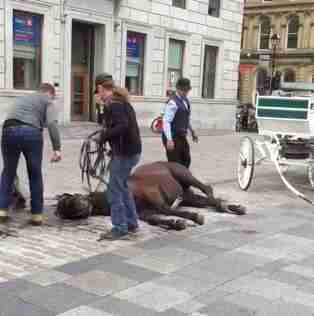 The horse, named Cocotte, had been unconscious for a total of 10 minutes when the police happened on the scene. According to the Humane Society of the United States (HSUS), horse-drawn carriages are painfully outdated — when a 2,000-pound animal is sharing the roadway with cars and motorcycles, it has a negative impact on both public safety and animal welfare. In just two days, Villeneuve’s disturbing video had already racked up nearly 5,000 likes and almost 20,000 shares, inspiring debate from Facebook commenters. However, this was no isolated incident, explains Mirella Colalillo, a spokesperson for the Anti-Calèche Defense Coalition, a grassroots movement based in Montreal. “This summer has been the worst by far. There have been so many horses underweight, injured and showing signs of distress, that we are heartbroken and feel helpless,” Colalillo told The Dodo. As for Villeneuve, posting the video has inspired animal activists and politicians to call for a ban on calèches — and made her the target of quite a few social media commenters. But, despite the attention, she is glad she took action and helped the working horses of Montreal. To help ban calèche horses in Montreal you can add your signature to this petition, or send a letter to Mayor Denis Coderre here.